Permeable pavements originated in Europe almost 50 years ago. They started as open aggregate bases and subbases which were able to drain and contain stormwater. In order to support vehicles, they were reinforced using a variety of cell structures made of concrete or plastic. Modern permeable systems consist of a surface of open-graded aggregate asphalt/concrete or segmental brick/concrete paving units with joints or openings that allow water to flow freely into an open-graded aggregate base/subbase reservoir. Water is collected and stored in the reservoir before it leaves the pavement structure. Permeable pavements are used for roadways, shoulders, alleyways, parking areas, sidewalks and driveways. Permeable pavements are an effective method for reducing stormwater runoff and pollutants from urbanized areas and can function well with minimal maintenance. Design pollutant removal efficiencies are on the order of 85 per cent for total suspended solids, 35 per cent for phosphorus, and 30 per cent for nitrogen. Permeable pavement systems do not typically remove dissolved forms of chemicals, salts, metals, or nutrients. 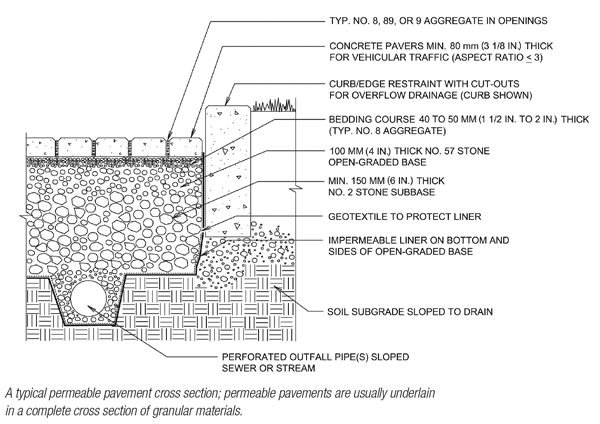 There are several types of permeable pavements. A full infiltration design permits stormwater to enter the pavement and be transmitted directly into the subgrade. This type of permeable pavement design is used for sandy type subgrades which have high infiltration rates. A partial infiltration design permits water to be stored in the pavement structure. Other designs over expansive or fill soils, or close to buildings, may enclose the pavement structure with geomembrane (impermeable liner). An outlet pipe provides temporary storage and outflow control. This design approach can also be used for water harvesting. The use of a geomembrane to restrict infiltration into the soil subgrade is often called a low infiltration design. When stormwater is infiltrated through the system, the water is filtered, and suspended particles within the water are captured and held within the bedding and aggregate layers. Design of permeable pavement requires a balance in providing a structure sufficient to withstand traffic while achieving stormwater management/hydrologic design goals. High-quality construction techniques and proper maintenance are critical to longevity. Permeable pavements are not suitable for every application, but with the proper design, construction, and maintenance, they provide a low-impact, green alternative that is worth considering. They may be more cost-effective than conventional pavements by conserving land use (runoff detention facilities not required) and by reducing drainage infrastructure. The National Asphalt Paving Association (NAPA), American Concrete Paving Association (ACPA) and Interlocking Concrete Pavement Institute (ICPI) have published guidelines for the design, construction, and maintenance of permeable pavements. The American Concrete Institute (ACI) and the American Society for Testing and Materials (ASTM) have published test methods for permeable concrete pavement placement. In addition, the American Society of Civil Engineers (ASCE) has recently published a new standard guideline for the design, construction, and maintenance of permeable interlocking concrete pavement (ASCE 68-18). Urban design features The cross-section of the pavement is usually underlain by granular materials. These materials need to be protected from erosion by providing them with a hard surface. Subsurface water flow typically is directed to longitudinal subdrains connected to the storm drain system. Other urban design features, such as curbs, gutters, safety barriers, retaining walls, and noise barrier walls, may also be included in the design. Supplementary surface drainage features The permeable pavement may not have sufficient surface permeability to infiltrate water from major storm events. In these cases, supplementary surface drainage features, such as curb cutouts, may be provided to direct water from the pavement surface to other stormwater features. Adjacent buildings and other pavements Permeable pavements may be constructed adjacent to buildings or conventional pavements with dense-graded bases. Building foundations should be protected from water infiltration by sloping the permeable pavement away from the building, protecting the building foundation by waterproofing or installing an impermeable liner vertically against the foundation wall or conventional pavement and along the nearest sides and bottom of the permeable pavement. Driveways Permeable pavements are popular for residential driveway use. The pavement structure would normally consist of 200 to 300 mm (8 to 10 inches) of open graded aggregate base with a top size of about 25 mm (1 inch). The base is then surfaced with 50 mm (2 inches) of bedding stone and 60- or 80 mm-thick pavers. If the driveway subgrade is a fine graded material such as fine silts and clays, and/or is located in an area subject to heavy rain, the base may require supplementary drainage to a ditch, swale or curb to drain potential stormwater overflow to catchbasins or other drainage appurtenances. Supplementary drainage may also be required if the water from gutter downspouts or the from the area surrounding the driveway is drained onto the driveway surface. Monitoring well For large-scale applications and demonstration projects, the permeable pavement should include a vertical perforated pipe, 100 to 150 mm (4 to 6 inches) in diameter, that serves as an observation well. The bottom of the pipe can penetrate the subgrade and be protected and supported during base/subbase filling and compaction. The pipe should be located near the permeable pavement system low point, at least 1 m (3 ft.) away from the edge of the permeable pavement. Construction of permeable pavements is similar to the construction of a pavement incorporating an open-graded drainage layer. Care must be taken during construction to prevent damage and contamination of the permeable pavement system. A preconstruction meeting is highly recommended to identify sequencing and controls to reduce the potential for clogging of the permeable pavement surface, as well as the other unique construction considerations for permeable pavement. Up-gradient surfaces that may contribute run-on to the permeable pavement during construction should be stabilized or the permeable pavement should be protected by using silt fences. Compaction of the subgrade is necessary to support the design traffic, and it would not be practical to limit compaction of the subgrade directly below a permeable pavement. 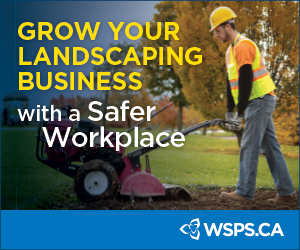 Underground utilities should be protected from damage due to construction activities. As the permeable pavement infiltrates water into the subgrade, it may be necessary to protect some utilities from water damage, such as water intrusion and/or preferential flow of infiltrated water through utility trenches. Utility companies should be contacted to determine if the utilities require special attention. Proper and timely maintenance is critical for permeable pavement systems. The surface of the permeable pavement should be properly maintained to provide a durable and safe driving surface, as well as to minimize the clogging potential. The ability of the system to effectively infiltrate water can be affected by pavement use and maintenance practices. Extensive use of winter sanding and biomass loading from surrounding vegetation (trees, grass, weeds, etc.) can substantially reduce system infiltration and should be avoided where possible. In the past, conventional wisdom held that regular preventive maintenance activities such as vacuum sweeping could help maintain system permeability. In areas where permeability was reduced by sanding, permeability can be restored by more aggressive maintenance practices, such as power washing and regenerative air vacuuming. Inspect and monitor the integrity and function of the permeable pavement. Permeability checks should be completed using standard infiltration tests (ASTM C1701-09 for porous asphalt and pervious concrete and ASTM C1781-13 for Permeable Interlocking Concrete Pavement (PICP). Visual inspection of clogging and durability. Inspect permeable pavements after major rain events to ensure pavement structural integrity and surface infiltration. It is recommended that vacuum sweeping be performed twice per year, or more often in areas subject to higher concentrations and deposition rates of dust and debris, ​biomass loading, etc. Restore any joint filler loss for PICP. Properly maintain upstream drainage pathways and landscaping to minimize additional water and run-on of sediment and debris. Inspect and clean all outlet structures to ensure positive water flow from the pavement. Provide inspection ports and regularly monitor drainage rates of the stone reservoir to identify if clogging of underlying soils or outlet structures has occurred; remedy to avoid damage associated with extended ponding. Eliminate the use of sand for winter maintenance activities. Clearing snow completely after every storm is recommended. Raised plow blades are not recommended, and any bouncing movement of the vehicle may result in damage to the permeable pavement surface. Limit the use of winter deicing chemicals for sensitive vegetation areas, sensitive receiving waters, or for pavements designed to capture and reuse water. Uniformity in all installation procedures is key. Thickness design for application (vehicles, pedestrians, etc.). Provide uniform support for pavement. Good quality edge restraints for all pavements. Provision of good drainage (both surface and subsurface). Quality placement of the pavement surface. Protection of the pavement from debris or other contaminants that may reduce the permeability of the pavement. David Hein is an engineer with the Toronto-based Transportation Infrastructure Division of Applied Research Associates.